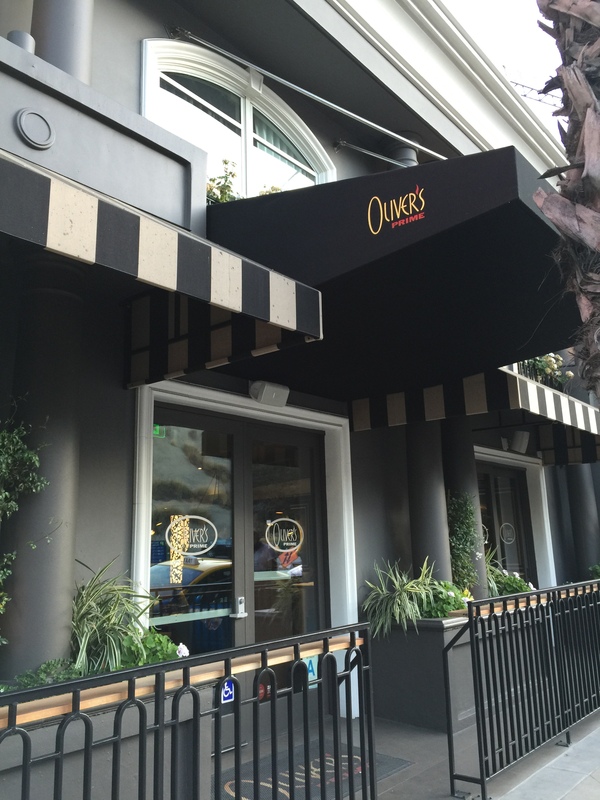 Located in the heart of the Sunset Strip inside the swanky Grafton Hotel, Oliver’s Prime Steakhouse specializes in meat and seafood of the highest quality that comes from family-owned farms and locally sourced and sustainable products. When it comes to steakhouses, you don’t have to ask me twice as I’ve never met a steakhouse I didn’t like and my husband knows this. 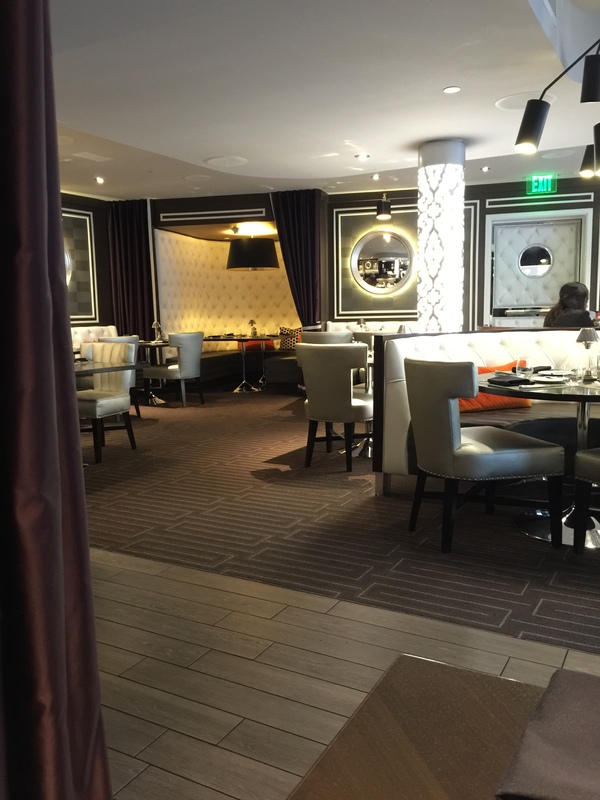 The restaurant is made for those who want to see and be seen in the middle of the West Hollywood/Sunset neighborhood. The interior of the restaurant is decorated using modern colors and designs. Lots of white to add light, but also lots of rich, dark colors using a lot of dark purple and black and gray in the color scheme of everything from the seating to the curtains they use to separate certain seating alcoves that they’ve created. The space is intimate, but yet vibrant and different from your traditional steakhouse look of dark woods and old world style. 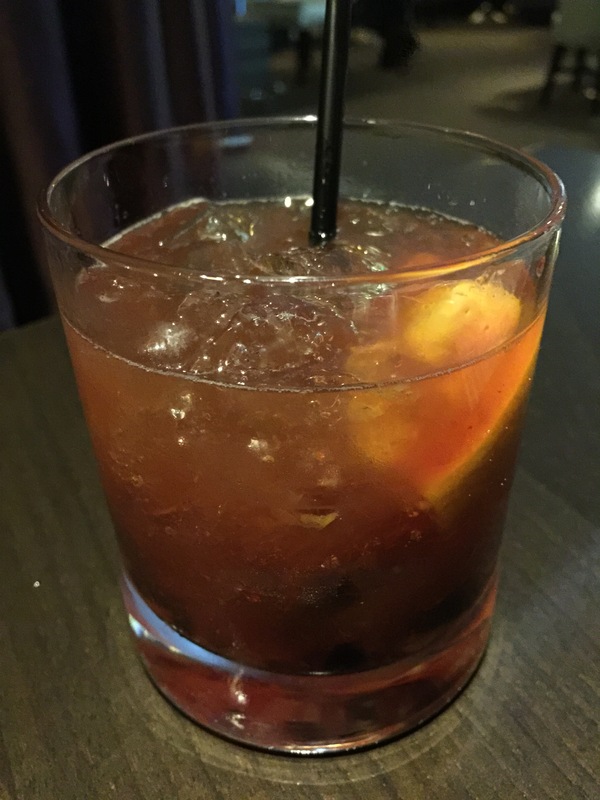 My husband started his evening off with his new go-to drink, an Old Fashioned made with rye whiskey. My husband’s immediate reaction was that the drink was really good and Oliver’s bartender certainly didn’t skimp on the booze in the drink, which is always appreciated. Definitely the type of drink that could get you hammered after a couple. Shortly after we got our drinks, we received an offering of fresh baked bread and sauces brought to the table. This is in place of the traditional bread and butter offering. 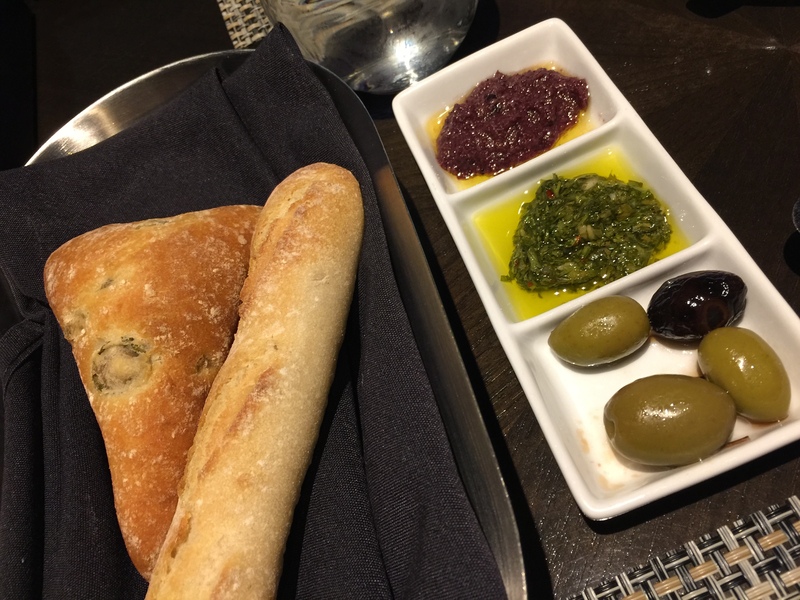 Instead of butter, our choices were olive tapenade, chimichurri and marinated olives served with a baguette and olive bread. I really enjoyed the chimichurri sauce which was just a little spicy and full of flavor. 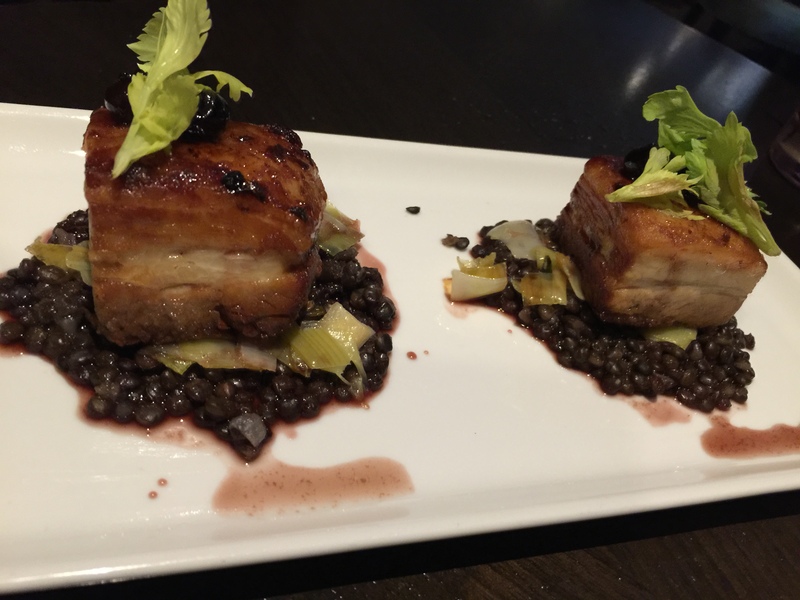 As a starter, we ordered the house cured pork belly. We figured that anything with pork belly would probably be pretty good. Served with beluga lentils, leeks and lingonberry gastrique, it sounded interesting and different. It was a good choice as a starter and my husband and I both enjoyed it. The pork belly was rich and flavorful and meaty. I enjoyed that it had a good amount of meat and not just fat. The lingonberry gastrique was unique and different and worked really well with the pork belly. The sauce was both a little tart and a little sweet at the same time. My husband admitted later that this dish was much better than he thought it was going to be. My choice as a starter was the American wagyu beef tartare, one of the speciality dishes of the chef. Served with shaved pecorino, quail egg, arugula and mustard dressing, this tartare was a little different than your traditional tartare. It’s hard to see in the picture, but the quail egg is served in its shell with just the top of the shell cracked open. The waiter told us that we are to dump the quail egg onto the tartare and mix it into the beef ourselves, but with the warning not to eat the shell. I assume this means that there have been those who haven’t realized and eaten the egg and shell. It was definitely a unique way to serve the tartare that was both beautiful and interactive. 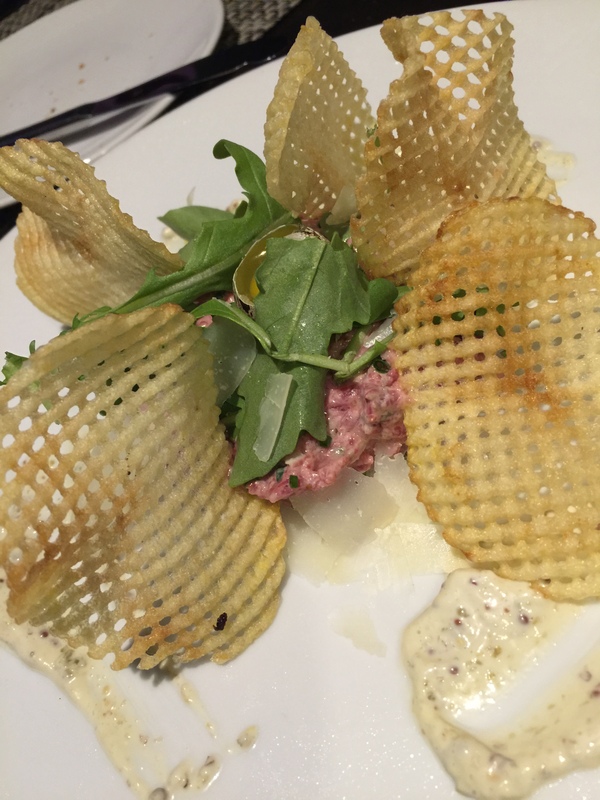 The wafer chips served with the tartare were fantastic and it’s something different than just serving it with a crostini or some other bread product. The tartare itself was bright and fresh. Those are the two best adjectives to describe the dish. The mustard dressing added a great pop of flavor that was quite refreshing and vibrant and worked well with the wagyu beef. The beef itself was tender and flavorful and chips added a terrific crunch and texture contrast to the dish. This was definitely one of the most favorite tartare dishes I’ve ever had. For my meal, I ordered a steak, of course. 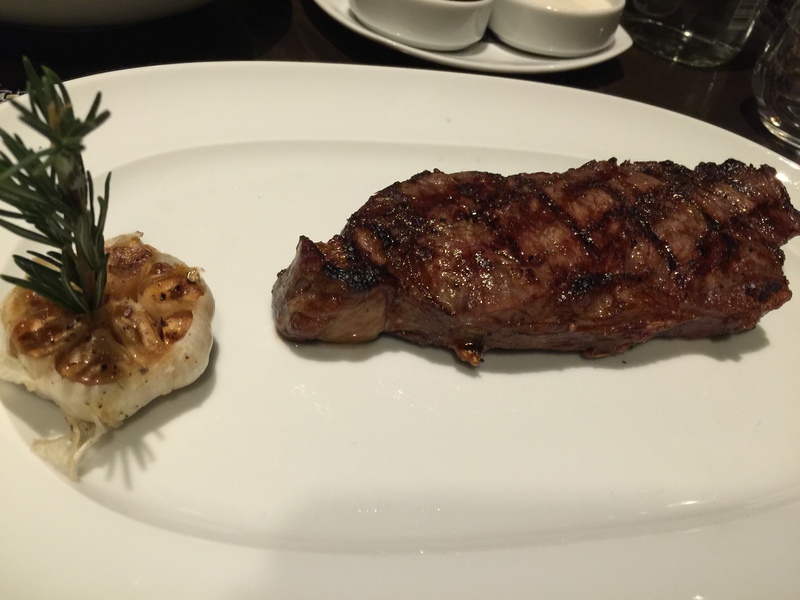 The 12 oz New York Strip striploin steak was my cut of choice. Considered to be American wagyu beef from Creekstone Farms, this was one of the juiciest steaks I’ve ever eaten. The steak was cooked to a perfect medium rare, nice and grilled with a bit of char flavor on the outside and nice and rare on the inside. The juiciness of the steak made for an incredibly flavorful steak, which was terrific. No accompaniments necessary to just taste the delicious steak flavor. And being a terrific cut of American wagyu, the steak was so tender it was hard not to fall in love with it. As a side, I couldn’t help but order the crispy Brussel sprouts. I’ve become a huge lover of Brussel sprouts over the years and I just help but order it whenever I see it on the menu. 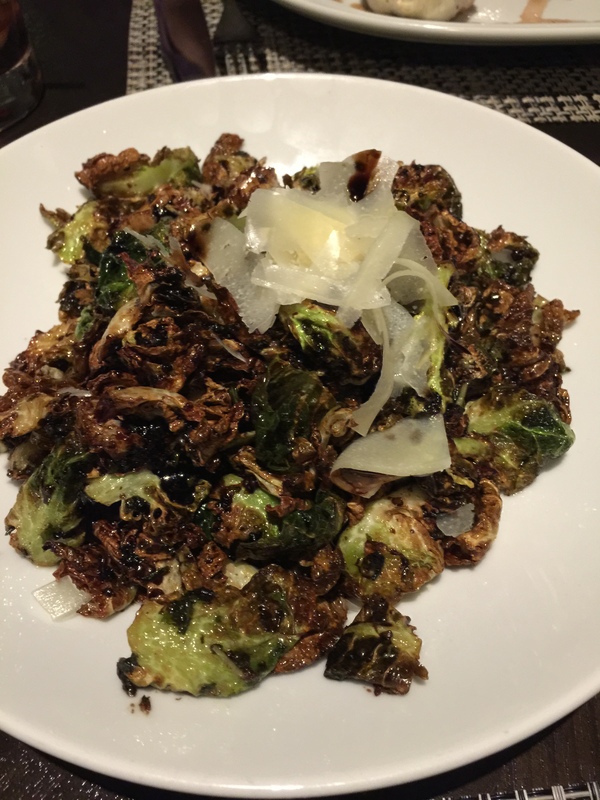 These crispy Brussel sprouts were tossed in a balsamic dressing and topped with some shaved cheese, probably some sort of an asiago or something with a bit of a nutty flavor to it. The Brussel sprouts were fantastic. I loved the great crispy crunch to them. They were perfectly cooked and the leaves were crunchy and flavorful and the touch of balsamic added a bit of tang to the crunch and the cheese added some nutty notes. I just loved it. 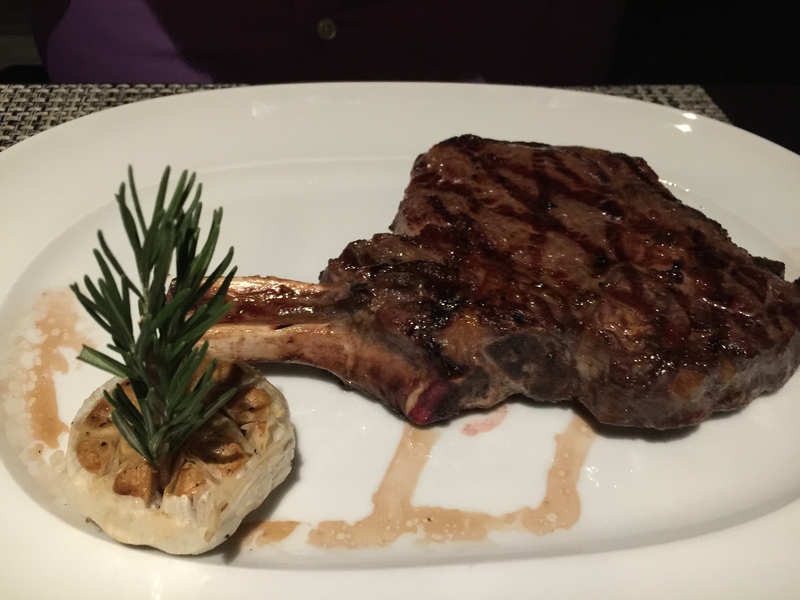 My husband ordered the 16 oz bone-in rib eye chop graded USDA prime and also from Creekstone Farms. My husband, who isn’t even as close to being the kind of steak lover that I am actually really enjoyed this rib eye. His first comment was that this was the best cut of steak he can remember ever having been served. There wasn’t nearly as much gristle on this rib eye and the fat was rendered off of it much more when grilled which created such terrific flavor. The way the rib eye was cut, my husband commented that it minimized the fat and maximized the meat, which on a rib eye is huge as sometimes you get a cut of rib eye and it’s a lot of fat and a lot of gristle which is just not edible. But this was a perfect cut and therefore, the flavor was just amazing. 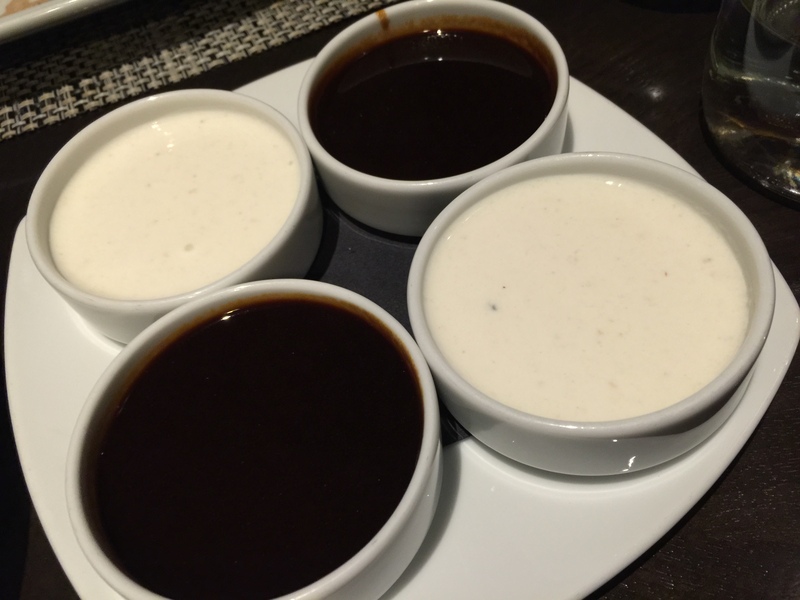 With our steaks, we were also given a side of creamy horseradish sauce and a red wine sauce to enhance the steaks. After biting into our steaks, we both discovered that they were both flavorful enough and juicy enough that we really didn’t need these sauces. However, I must say that the horseradish sauce was really tangy and had that bit of horseradish bite to it that was terrific if you are a fan of horseradish. The red wine sauce was full bodied and incredible full of flavor, almost so much so that it overpower the flavor of the meat itself. Garlic parmesan fries was my husband’s choice for a side dish to go with his steak. 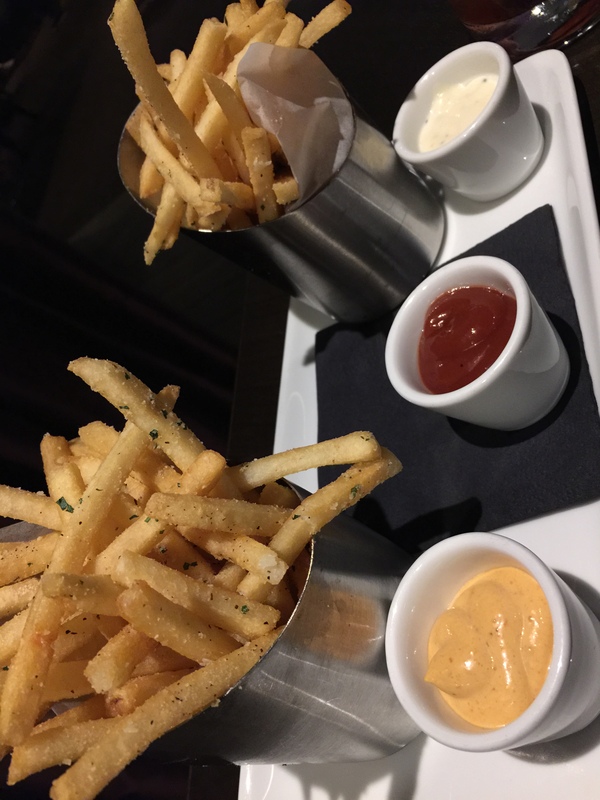 Served with a variety of dipping sauces, including ketchup, ranch and a zesty aioli, Oliver’s was nice enough to separate the fries into two separate cups for us to split. The fries were well fried and were nice and crispy on the outside and still tender on the inside. There was definitely a good garlic and parmesan flavor to each fry which was terrific and almost made the dipping sauces unnecessary. However, the zesty aioli was quite terrific and was my favorite of the three sauces. After a filling dinner, my husband and I couldn’t quite decide what we wanted to do for dessert. At first, we thought about sharing a dessert as we were both full. However, after we looked over the dessert menu, we decided to each order our own dessert as we each saw something we wanted. 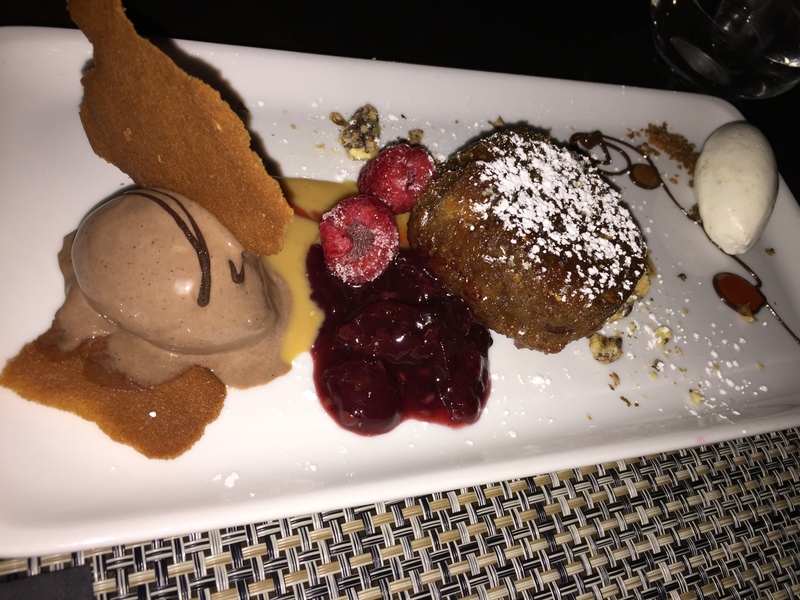 I ordered the chocolate lava cake with creme fraiche gelato and raspberry coulis. 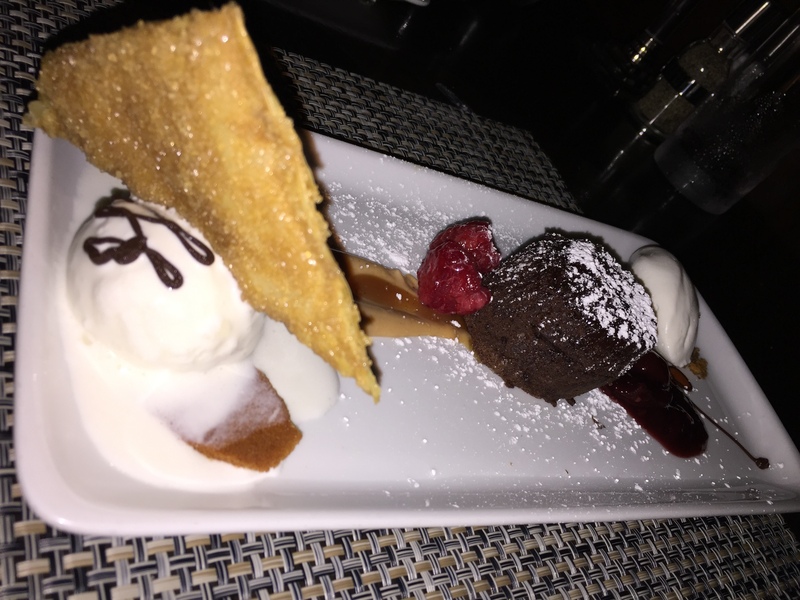 The dessert was served on this long rectangular plate and looked like a work of art. I liked the crispy cinnamon tortilla chip that came with the creme fraiche ice cream. The ice cream itself was different, not as sweet as vanilla ice cream, but pretty much tasted like vanilla. I’m not sure I picked up the tangy notes of creme fraiche. I must say that the chocolate lava cake disappointed me. It looked so good, but some sort of spice that they added to cake threw off the flavor of the cake for me and I found it difficult to eat and enjoy. It was some sort of warm spice, something that reminded me of winter and the warm spicy notes you find around the holidays. However, it just didn’t go with the theme of the dessert and it wasn’t a flavor I expected so when I tasted it, I wasn’t in love with it. My husband ordered the bread pudding with caramel creme anglaise and chocolate whipped cream. The bread pudding itself was pretty good with a strong caramel flavoring it was doughy and spongy and just like bread pudding should be. If they had stopped at that, it would have been fine. However, on the plate there was some sort of fruit puree which my husband didn’t enjoy at all. The chocolate whipped cream was more like ice cream. But instead of being just plain chocolate, it was more like Mexican chocolate, or had some sort of spice to it that was just overpowering and my husband didn’t enjoy it at all. It was much like the spice I found in my chocolate lava cake, my husband had some sort of spice in his chocolate whipped cream that was just too much as well and a flavor combination that didn’t blend well with the chocolate at all. This too ended up being a disappointing dessert. So, we started off thinking that we only wanted to share one dessert, read the dessert menu and decided to order two, and then in the end we were quite disappointed in both desserts. Not the best ending to the meal. Of course, when we were finished with dinner, my husband said to me, “now you can’t say I didn’t take you where you wanted to go for your birthday.” Technically, it was my half-birthday, but my husband said I was being too nit-picky. A birthday, a half-birthday, it was the same thing. So, yes, eventually, I did get to go where I wanted to go for my birthday. Oliver’s was a fun experience. The restaurant’s décor and stylish interior was fun and contemporary, and really, very different from any traditional steakhouse. The food was a little different as well. While Oliver’s served all of the meats and sides of a normal steakhouse, they also offered up some fun takes on other classics as well. The only part of dinner I didn’t like was dessert, which was kind of disappointing since I’m such a dessert fan. While I enjoyed Oliver’s and I’m glad I finally got to try it, I’ve come to realize that sometimes a steakhouse is just a steakhouse and sadly, I won’t be disappointed if I don’t get the chance to go back to Oliver’s. It was good, but there are many good steakhouses around.